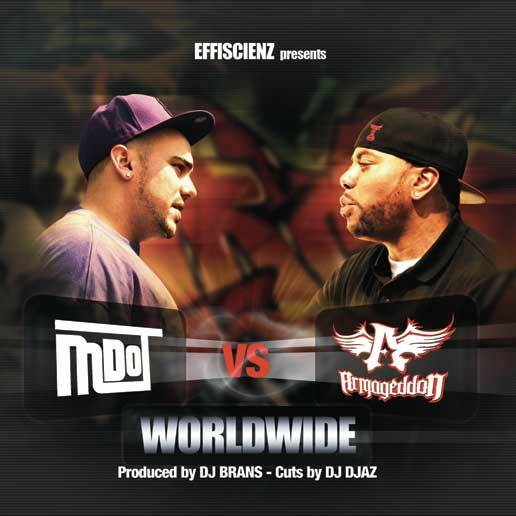 Mass Hip Hop: MP3 Single: Armageddon (formerly of Terror Squad) & M-Dot "Worldwide"
MP3 Single: Armageddon (formerly of Terror Squad) & M-Dot "Worldwide"
Armageddon (of Terror Squad fame) & M-Dot come together for Worldwide a hard-hitting lyrical chess match over a DJ Brans produced backdrop. The new single is off DJ Brans BRANStorm an LP to be released later this year. Mixtape: Mayhem "Early May 3: Mo' Retro"
MP3 Single: Dean Swift "Curb Your Enthusiasm"
MP3 Single: Jus Clide "So Long"
Video: Retrospek "Boom Bap and Beyond"
MP3 Single: Notoriety "People Talkin'"
Video: Nick Cincotta "I'm On"
Mixtape: Prano "Road To The Greenhouse"
Video: Dean Swift "The Brief"
Mixtape: Dean Swift "The Low Pro"
MP3 Single: Cheiflo and Key Fiya "4AM"
Video: Phat Peazy "Broken Dreams"